This Jungle Hunter Machete from Black Legion is a must-have if you are braving the jungles! Crafted of one solid piece of cold, rock-hard stainless steel, this full-tang beast measures in at a whopping 25" overall. The razor sharp blade features cut-out designs, heavy sawback serrations, and a durable baked-on black finish. A nylon sheath completes the package. Got mine in and it's exactly what I needed. Thanks again. I've been eyeballing this one for a while. Then, during a ten dollar Tuesday sale, I finally got it. So glad I did. This thing is light, mean, and sharp. Can't wait to take this in the back yard and mess stuff up. Black Legion rules! Thanks BudK! When i first got it i thought i wouldnt luke it becuase of the lightness, but its great! Best machete i own. Not exactly conquer the world though it chipped a little after a bad use on my part. But otherwise amazing. This thing is beefy and very lightweight. The handle is very comfortable. Very sharp out of the the box. The sheath is nice quality too! This far surpasses any "be-good-stick" out there. Zombie apocalypse? This one is for you! 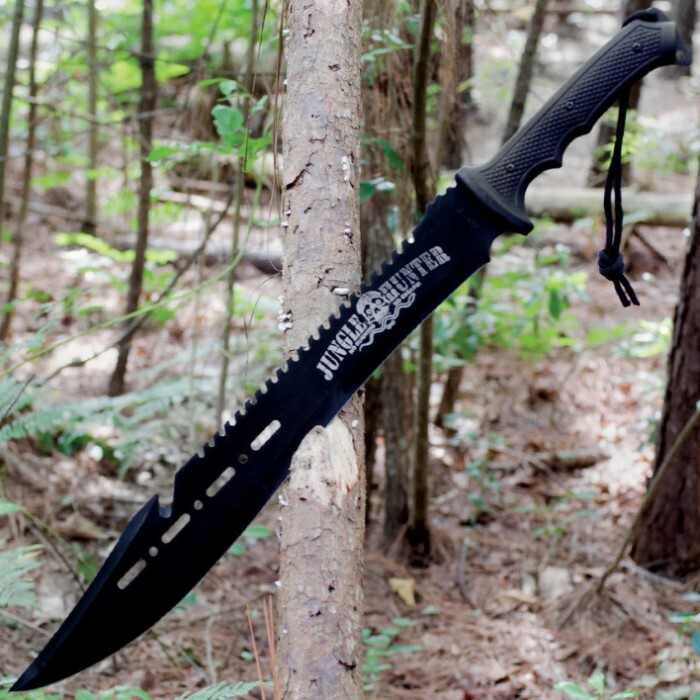 This machete was cool for about 5 minutes, cut through multiple 1 to 2 inch branches of a dead tree with ease. then one of the pins busted out within 10 minutes. Next the handle grip shattered to pieces since the plastic is formed to be hollow. Then it gets worse... about a half inch deep gash by one inch wide chunk of "AUS-8 steel" ripped out of the striking part of the blade. Would not use this in the jungle, would not use this in survival mode, would not even use it in the back yard on a dead tree. 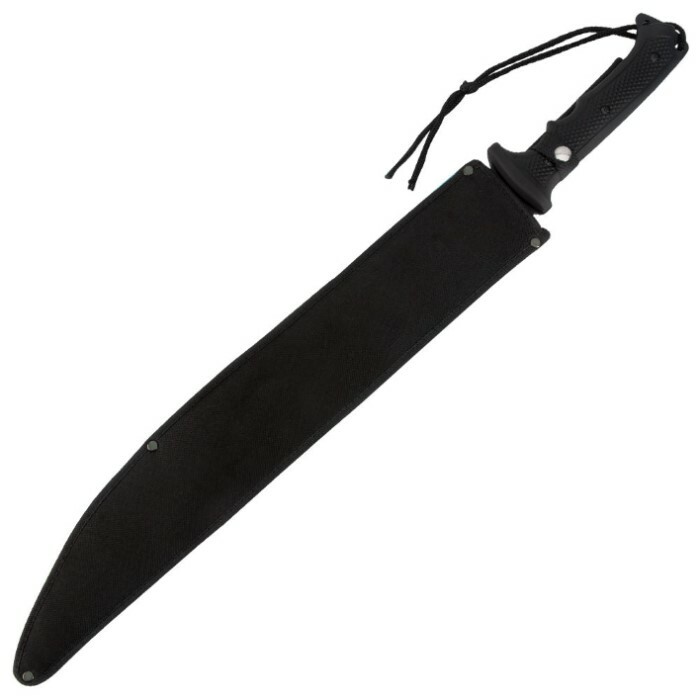 This machete is amazing. The quality and how sharp it is and stays is fantastic. Bought one originally loved it so much I bought a second. 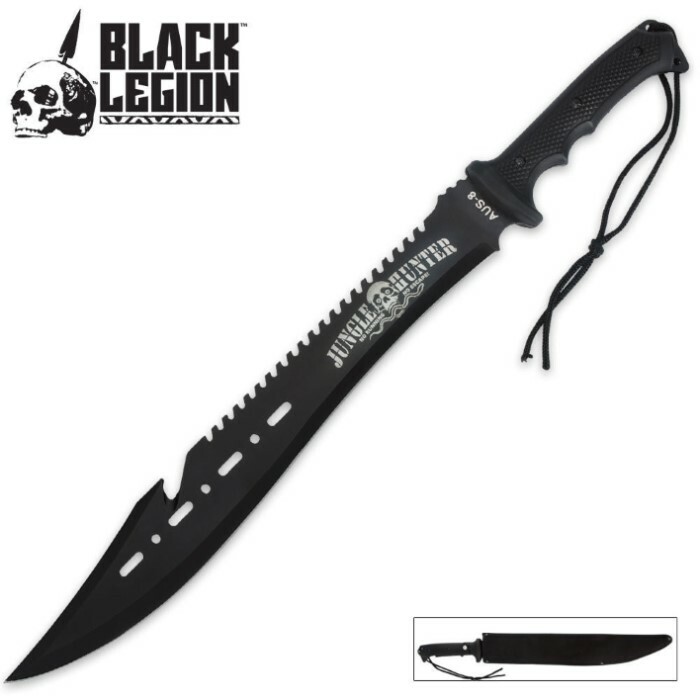 For the price id say its the best buy for a machete. This blade is great. I've practiced my swing with it and cut down numerous things from small branches (mesquite) to old soda cans in mid-air. To just slicing thru thick cuts of weeds. I would recommend this as the handle/grip is excellent for enduring the swing and brunt of each strike on solid objects. It's weighted but not a problem for me as my technique has changed for this. Great product and thanks BUDK!